NASA and its commercial partners say they’re studying the possibility of sending astronauts beyond the moon years earlier than planned, by putting a crew on the first flight of the space agency’s heavy-lift Space Launch System. The NASA study, sparked in part by a desire for the Trump administration to do something dramatic in space during its first term, would consider whether such a flight could occur in 2019 or 2020. The current plan calls for an uncrewed test flight of the SLS and NASA’s Orion capsule in late 2018, known as Exploration Mission-1 or EM-1. That mission would followed by a crewed test flight called EM-2 in the 2021-2023 time frame. In a statement, NASA said acting administrator Robert Lightfoot asked Bill Gerstenmaier, the agency’s associate administrator for human exploration and operations, to assess whether the first crew could ride on EM-1 instead of EM-2. “The study will examine the opportunities it could present to accelerate the effort of the first crewed flight and what it would take to accomplish that first step of pushing humans farther into space,” NASA said. 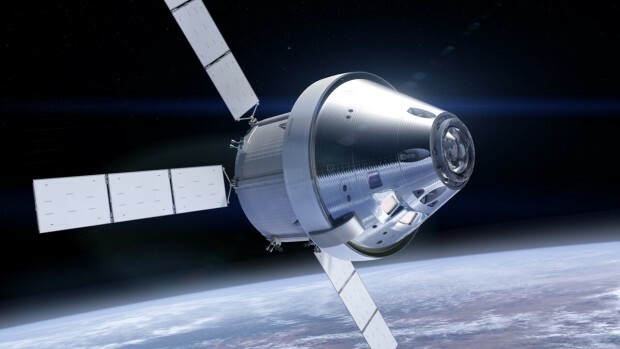 Gerstenmaier discussed the study with NASA’s commercial Orion/SLS partners at a conference today in Washington, D.C. NASA representatives declined to specify how long the study would take, but some of the reports that emerged after Gerstenmaier’s talk suggested a 30-day time frame. EM-1’s current mission plan calls for sending the Orion capsule on a trajectory beyond the moon, most likely into lunar orbit, and then back to Earth. No lunar landing would be attempted. The trip would be similar to Apollo 8’s “Earthrise” mission in 1968. The current plan calls for EM-2 to go beyond the moon as well. The revised plan would force NASA and its partners to ensure that EM-1 had all the safety and life support features required for human spaceflight. That’s why EM-1 would have to fly somewhat later that currently planned. The crewed Orion/SLS flight would mark the first trip for humans beyond Earth orbit since NASA’s last Apollo moon mission in 1972. There’s another historical angle if the round-the-moon flight were to take place in 2019, in that it would come during the golden anniversary of the Apollo 11 moon landing. Boeing and Lockheed Martin, NASA’s two main commercial partners in the multibillion-dollar Orion/SLS program, both said they’d look into accelerating their schedules. Boeing is the prime contractor for the SLS rocket, while Lockheed Martin is the prime contractor for the Orion crew capsule. Lockheed Martin is also on board with the study, said Allison Miller, a spokeswoman for the company’s Orion program. “We’ll look at accelerating remaining crew system designs, as well as potential technical and schedule challenges and how to mitigate them,” she said in an email. Word of the potential schedule shift comes after weeks of speculation over how President Donald Trump and his advisers might change the focus of the nation’s space program. Trump’s predecessor, President Barack Obama, had initially set NASA’s sights on sending astronauts to a near-Earth asteroid in the mid-2020s, followed by trips to Mars and its moons in the 2030s. Those plans have morphed over the years, and at the same time, billionaire-backed commercial ventures such as Elon Musk’s SpaceX and Jeff Bezos’ Blue Origin have upped the ante. Last fall, Musk unveiled plans to send settlers to Mars in the 2020s, and Blue Origin executives said their long-term vision for spaceflight included trips to the moon and Mars as well. Some of Trump’s advisers reportedly pressed for an accelerated campaign to send astronauts on trips around the moon, and put commercial robotic landers on the moon’s surface, by 2020. One scenario even called for an “internal competition” between NASA’s traditional industrial partners and more recent market entrants such as SpaceX and Blue Origin. NASA’s Lightfoot addressed the debate in a memo he sent to the space agency’s employees today. Trump hasn’t yet nominated an administrator for NASA. Lightfoot is serving in a caretaker role – but he is regarded as one of the prospects for the official appointment, along with U.S. Rep. Jim Bridenstine, R-Okla. Speeding up the schedule for sending astronauts beyond Earth orbit carries significant risks. It would be highly unusual for humans to get on board for the first test launch of a new type of rocket. Contractors would have to shorten their time frame for testing the hardware needed for crewed flight, ranging from launch abort systems to life support systems. Keith Cowing, a former NASA employee who now runs the independent NASA Watch website, said in a posting that the schedule speed-up looked like a “Hail Mary pass” for the expensive SLS program. “To move this rather important milestone up now in the midst of dueling and ever-shifting policy directions – for no clearly articulated reason other than politics – starts to smell like launch fever to me,” he wrote.